Learning how to meditate can help you to achieve success faster, because when your mind is clear and focused, and your body is relaxed and calm, you can access information, both internal and external, that can help you make better decisions. Do you ever find yourself irritated and it gets in the way of your performance? Are you ever so stressed out that you can’t sleep at night? Are you ever so overwhelmed you just can’t seem to stay focused? Do you ever have to make a major decision and just don’t know which way to go, or you’re looking for a solution to a problem and you just can’t find it? Meditation can help with all of these things. The more you meditate, the more access you have to your intuition. Keep reading and I’ll show you how to meditate with a guided meditation exercise that I enjoy using. This is something that even beginners can use. Meditation is a practice where you train your mind or induce a state of consciousness. You can meditate to realize some benefit, such as relaxation, stress reduction, healing, or strengthening your life force. Or for developing certain qualities such as love, patience, generosity, and forgiveness. Focusing on breathing, visualizations, mantras or meditation music can help bring mindfulness to the present moment. This sets the stage to calm your mind. Meditation can also be used to access inner wisdom and insight from your own higher unconscious or from a Universal power often referred to as God, infinite Intelligence, Universal Consciousness, or Source. It is also a powerful tool for accessing your creativity, your inner wisdom, and developing your intuition. For most people, this means to close your eyes, slow down your breathing, focus your goals by repeating a phrase without being distracted by anything else. Most people have a resistance to meditation. They think it’s too weird at first. Or they say they’re too busy to take the time to learn how to meditate. After reading this post, and discovering the simplicity, and many benefits of meditation, my hope is that you will try it in your own way. Three of the sources of my greatest successes came to me while I was meditating – the title for Chicken Soup for the Soul, which has become a brand worth several hundred million dollars and the inspiration for the creation of the Transformational Leadership Council and for our Online Train the Trainer Program which teaches people how to teach the success principles. There are many different forms of meditation that have been developed over thousands of years in many diverse cultures. I teach several of them in my Awakening Power audio program and you can learn one technique from the guide below. Learning to meditate is a journey, this guide will help you take the right steps. Download my free 4-Step Meditation Guide. In general, through meditation, you can do many things better. You make better decisions. A few of the mental health benefits of meditation include greater productivity and focus, less stress throughout the day, anxiety relief, and better sleep at night. Meditation helps reset your hormones, promotes faster healing, and getting sick less. It can help create longevity for a better life, build intuition, and discover your higher purpose. Some of the spiritual benefits of meditation include greater awareness of the world around you and a deep connection to yourself and your purpose. All those things sound pretty great, right? The reality is that you’re focusing on one thing so that everything else begins to drop away. During meditation, your mind quiets. You’re able to access your subconscious mind. When you first start meditating, you may notice that your mind begins to wander. If you sit with your eyes closed, trying not to think a thought, you’ll probably end up pretty frustrated, because your mind will tend to wander and you’ll think you’re failing. This is ok.
It’s much easier when you have guidance, when there’s meditation music, when someone’s voice is guiding you through the steps. Your mind doesn’t wander as much, and it’s much easier to follow along and not get lost in all the stories and the to-do lists and the thinking about the past and worrying about the future that we normally do. That’s what I want to do for you. Let’s start by getting into a position to meditate. What are the best meditation postures for success? It’s much simpler than you might think. You can meditate while sitting naturally in a chair. You can meditate sitting on the floor. You can even do it lying down in bed at home. If you lie down you have the tendency to fall asleep, but do whatever is most comfortable for you. Benjamin Franklin used to meditate holding a hammer about half an inch above his head so that if he fell asleep the hammer would hit his head and wake him up. He didn’t hold it so high that it would hurt him, but he was that committed to meditation. There are hundreds of different forms of meditation. I have explored in depth at least 20 different forms of meditation, including 10-day silent meditation retreats. I now practice 3 or 4 different forms on a regular basis. Each of the meditation techniques accomplishes different things in my experience. Some are calming and centering. Some energize and analyze the body. Some develop neutral witness or allow insight and wisdom to emerge. There is a form of meditation that combines all these into one that I teach in my Breakthrough to Success Training. I call it the Betty Bethard’s 4-Step Meditation. Since I learned it from Betty and have been teaching it in my groups ever since. I find this technique to be one of the most simple ways to meditate. It is also, profoundly effective. May it support your inner peace and wisdom. Let me talk to you about what each step entails, then I’ll guide you through the entire meditation. Physical Preparation: Avoid meditating on a full stomach, when overly tired, or while wearing restrictive clothing. Do not meditate while under the influence of alcohol or drugs. Use your own judgment when using prescribed medication. Mental Preparation: It is helpful prior to meditation to prepare yourself mentally. For example: you may read, discuss, or listen to or think about something of an inspirational nature. Environmental Preparation: Find a quiet time when you will not be disturbed by the telephone, doorbell or other interruptions. When you have moved into the inner stillness, all your senses are heightened, and a sudden noise can be a shock to your system. This meditation can be done sitting cross-legged on the floor, or as most people find more comfortable, sitting in a chair. Keep your body erect, feet flat on the floor, hands together in your lap. Let your hands touch together, fingertip to fingertip. Relax. It is helpful if your spine is straight. It is surprisingly easy to relax in an upright position. Imagine a string tied to the top of your head pulling straight up toward the ceiling. Take several deep breaths through your nose and exhale through your mouth. Then let your breathing become steady, rhythmic and relaxed. Imagine a pure white light coming up through your left foot, up the left side of your body, all the way to the top of your head, across to the right side of your body, and down the other side. Do this three times. You can also ask to be shown the way to truth, wisdom, and understanding. Repetition is simply the focusing of your mind on a single point. It is an essential part of meditation. It clears away the mental cobwebs and stills your active conscious mind. You can do repetition with your eyes open or closed, whichever proves better for you. If you use the eyes open method, fix your gaze on a single object. A tiny light or candle in a darkened room, a picture, a religious symbol, a mandala, the word Love. These and many other things have been used successfully as the focal point of repetition. A great many people, including myself, have better success with their eyes closed, visualizing a word, face, object or symbol in their mind’s eye, to increase concentration. It can be a religious symbol, a mandala, a flower, or a peaceful scene in nature such as a still lake. You may wish to focus on a word, a seed thought, or a phrase that has special meaning to you. There are many, many phrases that come from different spiritual traditions. If you don’t want to go into that, you can simply imagine inhaling the sound “re,” exhaling, “lax.” Like “relax.” You’re giving yourself a subliminal command. Repeat the phrase over and over without letting any other thoughts come into your mind. Whatever focal point you choose on which to concentrate, let it represent your highest spiritual idea, never something materialistic. At first, your mind will quite likely want to stray. Bring it gently back to the focal point of your concentration. As it strays again, bring it back again. Almost everyone finds their mind much too active to settle down to a single point at first. But, soon you will find your ability to discipline your mind to one point growing stronger and stronger. After a few minutes of repetition, you shift gently to receptivity for the next few minutes. Separate your hands and turn them palms upward in your lap. Keep your body erect and relaxed. Now let the mind you have been disciplining so vigorously relax. Do not exert any conscious effort to think about anything. Just set your mind free. If you did repetition with your eyes open, you must close them as you go into meditation. You have opened the various consciousness centers of your being. Remain relaxed and passive, yet alert. Thoughts and mental images may cross your consciousness. Examine them placidly as they come and go. You may “see” images and scenes or “hear” mental messages. An image that helps me is to imagine I am standing on the bank of the river simply watching boats fly by. I am just watching the thoughts and sensations that arise. The trick is to “watch” the thoughts and sensations as they arise. If you get lost and suddenly realize you are thinking rather than watching, just “climb out of the boat”, get back on the bank and become the watcher, the observer or the witness once again. It takes a while to develop this witness position, but the rewards of peace, calm, and insight are well worth the effort. At the end of your meditation, close both hands into fists and imagine a luminous white light surrounding you, filling, you and protecting you. The main idea is that you are learning to place yourself in an environment of protection, guidance, and control. This can be done in a variety of ways. For example, imagine yourself in a ball of white light, or in a white balloon, just so long as the white environment totally surrounds you. This procedure will close down the centers of your consciousness that you have opened during concentration and meditation, leaving your inner being protected from outside influences. Use this phase to visualize yourself achieving any goal you might choose. You could simply visualize yourself whole and healthy, or you might visualize yourself having achieved a particular goal. If you use an affirmation during the repetition phase and do a related visualization during this phase, this is very powerful. Your Inner Wisdom: After a while of meditating you will begin to discover that you have a great deal of wisdom inside. It is simply a matter of taking the time to listen to what is within, and your intuition, sensitivity, and alignment with the universe all begin to grow. It is as though all the powers of your mind and the secrets of the universe start to become available to you. You will grow in strength in these gifts so long as you seek them for service to your fellow man rather than for selfish, material ends. You can divide any amount of time into these 4 segments. I usually meditate for about 20 minutes during the week and for 40-60 minutes on the weekend. On a 20 minute session might look like this: Preparation (3 minutes), Repetition (7 minutes), Receptivity (7 minutes), and Closing Down (3 minutes). First, find a quiet place, close your eyes, focus on slowing down your breathing by taking four long, deep, slow breaths, and then imagine white or golden light starting in your left foot slowly moving up through the entire left side of your body and then down your right. Repeat an uplifting word or phrase such as “re-lax,” “so-ham,” “I am love,” or, “I am in the universe and the universe is in me,” silently over and over, for about 3 to 4 minutes. Third, you stop the repetition of your word or phrase and just move into a state of quiet, receptive observation, just noticing any thoughts, feelings or physical sensations that arise in your consciousness. Fourth, spend a few minutes imagining yourself surrounded by a spotlight or sphere of white light. After a minute or two of that spend the remaining minute or two visualizing your life goals as already achieved. The thought of learning how to meditate can be intimidating to some beginners as there are several types of meditation, such as Mindfulness, Concentration Transcendental, Kundalini, Qi Gong, Zazen and Vipassana… but new practitioners should not get lost in complicated details. What I’ve just taught you is a combination of all of these meditations. It is extremely simple to learn and practice so you won’t become overwhelmed. Just focus on improving one session at a time. Whatever form of meditation you do, remember that you can’t do it wrong. Whatever you are experiencing is fine. Don’t expect to have a totally clear mind or to achieve enlightenment overnight. Meditation is a daily discipline that you practice for years, but the benefits are so profound. When you first start, a few minutes is plenty. Over time you will find that you will want to meditate longer. It is a natural progression. I usually set the timer on my iPhone for 20 minutes. If you don’t have 20 minutes, just 5 minutes of concentrating on the sensation of your breath either by focusing on the sensation of the air coming in and out of your nose or the sensation of the rise and fall of your chest is better than nothing. Eventually, you will notice these instructions become second nature and your mind will be easier to calm by using the exercises. Be sure to focus on your breath and the sensations of inner peace and relaxation will follow closely. Try it for yourself. Get into a comfortable position and focus on your breath. You can focus your mind on one of your personal affirmations. Another way to calm the mind is by visualizing a peaceful scene such as clouds floating by or the waves on a windy lake growing calmer and calmer. Start by doing this for at least 5 minutes every day, then build on the amount of time you spend meditating, and in a few weeks, reassess how you feel mentally and physically. In addition to peace of mind, I guarantee you’ll notice increased clarity and energy in your life when you figure out how to meditate. Leave a comment below and let me know if you’ve ever tried meditation and, if so, in what ways it has it benefited you? The process of figuring out how to meditate properly doesn’t need to be overcomplicated. Due to its simple nature, the proven psychological benefits will gradually grow stronger and stronger, improving your emotional and mental health with every session. As a result, you will make room for more success in your life by removing mental clutter that weighs down your cycle of completion. If you would like to start practicing meditation, then I strongly encourage you to download this 4-Step Meditation Guide pdf. 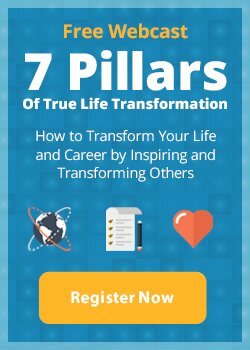 It will help you understand the techniques used to reduce stress, overcome anxiety, clear your mind and listen to your intuition so you can tackle any challenge in life with clarity and ease.